The most important part of the Time Circuits is the LED display. The first challenge is locating suitable displays. Alphanumeric LED displays are considered obsolete and not easy to find – especially in all 3 colors needed. A while back when I first considered building this, I found that Kingbright still makes alphanumeric displays and several other similar projects were using them. I was able to find suitable 0.5″ Kingbright alphanumeric LED display in stock. There are two variations of these LED displays, both look the same and have identical dimensions, but have different pin-outs. Unfortunately, all three needed colors were not available in the same pin-out. So red and green will be the same, with yellow being an alternate pin-out. This meant two PCB layouts would be needed. Fortunately 0.56″ dual numeric displays were available in one pin-out for all three colors. So the changes between the boards will involve on the the 3 alphanumeric displays. 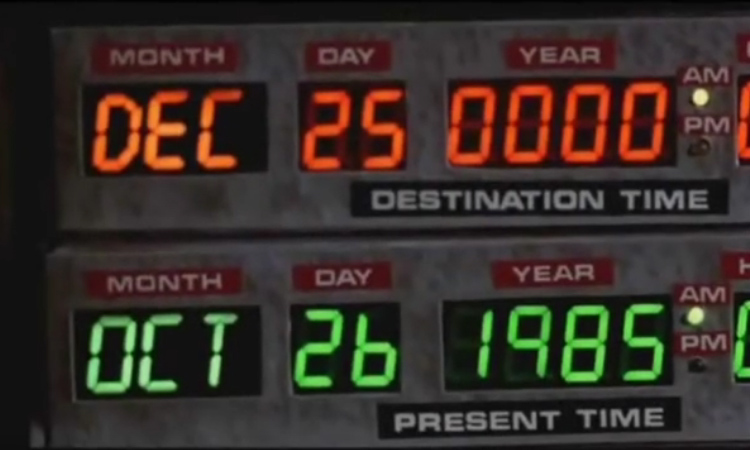 The original Time Circuits used single digit displays, however, these were not in stock in the needed colors. All numeric displays have an even number of digits, so the dual displays will work and actually make assembly slightly easier. With the LED displays selected and available, it was time to test printing the front panel and start layout out the PCB. Dimensions found on the Parts Not Included site were used to create the front panel. The resulting test print is below. I’m new to 3d printing and 3d design in general, the initial test seemed promising. The dimensions were exactly as drawn in the CAD software. Next it was time to create the PCB. 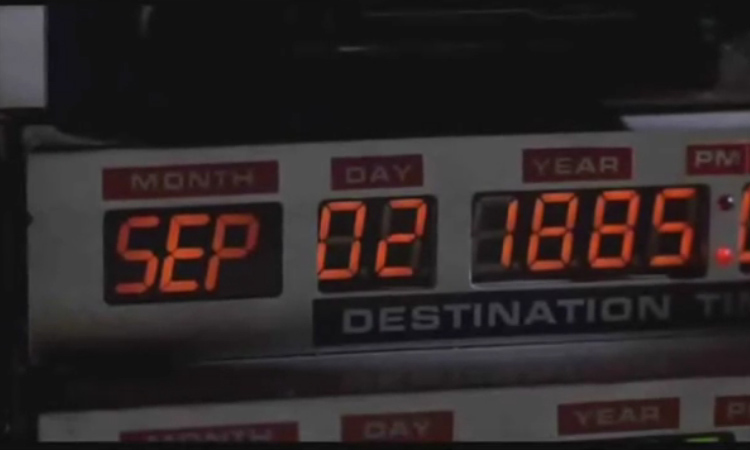 Below is a screen shot of the time circuits from the movie. 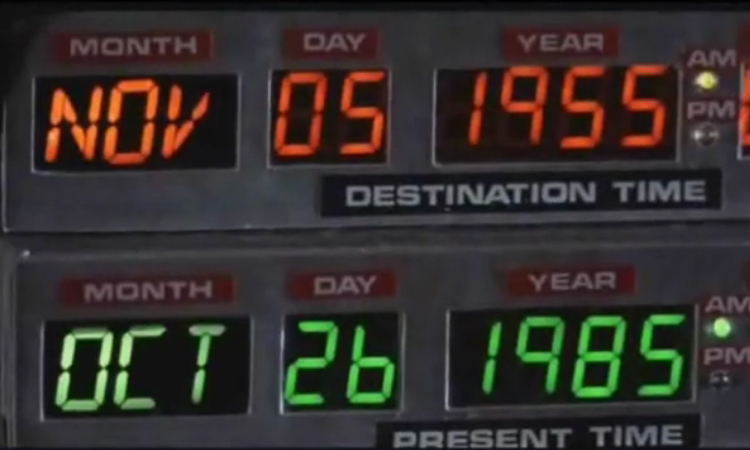 It appears that Doc had trouble finding alphanumeric LED displays as well. They appear to be colored filters with a mask in the shape of the letters with a incandescent light behind them. The un-lit segments on the numeric displays can been seen, they cannot on the alphanumeric displays. The alphanumeric displays are not evenly lit, which spans characters, as it would if there was light bulb behind it. Especially visible when SEP is displayed. And finally, when the display turns on, the numeric display slight immediately as the LEDs do and a slight delay for the month since an incandescent light takes time to reach full brightness. There’s a shadow at the top of OCT in the photo above, that would come from behind. They colors of the alphanumeric displays don’t match the numeric displays. The bottom diagonal part of the V is longer than the diagnoal part of the N, they’re equal on real displays. I’d expect these to be common then, not often found in consumer electrics, but defiantly in commercial and industrial equipment.